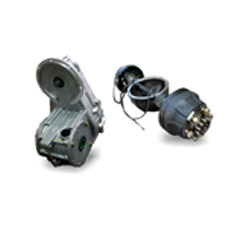 We distribute an extensive selection of FORKLIFT DRIVE AXLE parts for all makes and models. We ship directly from various warehouses located all over North America to provide the fastest shipping at the most affordable prices. Forklift Drive Axle is an integral part of the power of the forklift as it transfers power to the wheels via the differential gearbox. In appearance, the drive axles have solid steel rods at its ends, which enables the rear differential to vertically move up and down coherently with the rear suspension. It is located in the rear-end housing, concealed in steel, connecting the differential to each of the wheels. The drive axle comes in two types, live axle or dead axle. A live axle rotates the wheels connected to it while carrying the weight of the forklift. Whereas, dead axles describe axles that carry the weight of the forklift and are unable to rotate the wheels. When the drive axle is able to pivot with the turning of the wheels, it is called a steerable drive axle. 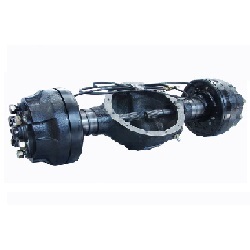 On the other hand, a drive axle that are unable to turn, such as those found generally in the rear wheels, it is called a non-steering drive axle. Some forklifts have installed steerable drive axle on all four wheels, which enables them to turn in the narrowest corners, such as tight aisles of a warehouse. The wheel has been regarded as one of the most important invention in the history of humanity. The oldest wheel found in available history exists in Mesopotamia, Russia, which is believed to be over 5,500 years old. The excavation of that wheel was carried out in 2002, and the wheel was found to be made of ash and oak, it was of 70cm radius with the axle of 10 cm of length, made of Oak. However, the history of wheel and axle dates back to around 3500 BCE. An everyday example of a wheel and axle can be seen in any big children park where a Ferris wheel is installed. The simplest example of a wheel and axle are found in forklift trucks where wheel and axle act as lever rotating around the fulcrum or the centre point. The force is transferred from one to another with a mechanical advantage. Axle allows the wheel to rotate around itself and facilitates movement and load carriage from one place to another. A hinge or set of bearings support the rotation of the axle. The axle and wheel assembly facilitates the transportation by simply avoiding friction. The friction, which would have come into play if the same amount of load had been dragged to a distance without incorporating wheels. By rotating about the axle, the wheel overcomes that friction and moves ahead with the load. These assemblies are used in almost everything, which involves transportation of men and material and hence are pivotally important for a forklift, which is essentially a weight carrier and transporter machine. Over centuries, wheel and axle have been used in numbers of applications with state of the art improvements and adaptations, especially in the wake of their use in forklift industry. The drive axle is a complex forklift component that performs different roles. For starters, energy must be facilitated vertically from the forklift’s engine and the drive axle must react to the input that comes from the steering well. In addition, the truck is designed to use energy efficiently. In order to make this happen, a number of systems work with the forklift drive axle so that movement can be managed and increased efficiently. Axle essentially is a cylindrical rod attached to the wheel, which is circular disk shaped object with a hole in the centre. The hole of the wheel and cylindrical circumference of the axle are matching to accept each other. Wheel is then attached to the body of the vehicle or forklift allowing it to move with the least possible friction. Axles being connected to the wheels bear the weight of whole forklift truck. Modern axles are not a straight cylindrical rod attached to both wheels, as was in vogue in medieval ages. 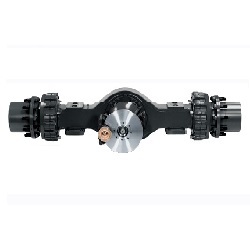 Modern axles are usually split axles, meaning that each wheel on either side is attached to a separate axle shaft. This arrangement allows for independent suspension of the right and the left wheels, adding in comfort and a smooth ride. The mechanical advantage is different rotation speeds of different wheels of forklift, especially while taking a turn. This improves traction and tire life. Forklift axle is connected to the wheel by a Constant Velocity (CV) joint. The CV joint makes the shaft rotate and transmit power at a constant speed. During this process, it controls friction and heat dissipation significantly. A boot covers the joint, called CV joint boot, which is a flexible covering that protects the joint assembly. This boot needs special attention and regular inspection for any cracks or leakage. In case of a crack or breakage the brake fluid can leak out, which can cause serious damage to CV joints and will render the braking system ineffective. Place the jack underneath the forklift frames and jack up the forklift. Ensure that the handbrake is engaged to stop any potential rotation of the wheels during the work. Take the bolts off of the wheels and pull out the wheel. Spray penetrating oil onto the caliper to loosen all of the components installed onto the axle. 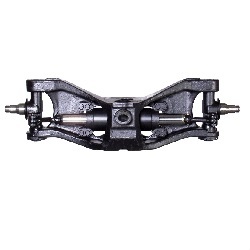 Hammer out the axle, which is located in the center of the calipers. Note: The axle when hammered may form a mushroom shape on the top, making it extremely difficult to hammer through. To prevent the mushrooming effect, screw on a nut over the axle and have it almost flushed, then hammer. Remove cotter pin behind the brakes. Place an oil pan underneath the side of the area where the axle is being pulled. Take out the axle out of the caliper. Replace with a new axle. Finding a new forklift drive axle for your forklift can be a difficult task as they vary in design depending on the model of the forklift. Solid Lift Parts Inc. provides drive axles for all makes and models of forklifts at affordable prices. Contact your parts specialist to have your drive axle for your specific forklift shipped to you today!